His brush moves like a conductor’s bow. A stroke. Then a flick. Always smooth. Very personal. With two panels on the easel at once, the arrangement of this painterly musical can be complicated, but years of practice have worn nicely on his hands. As they move freely with confidence to an internal rhythm, a concerto of color explodes on each canvas. The harmony blends polish with experiment – a touch classical with a lot of jazz. The result is a unique, artistic language that somehow sounds as beautiful as it looks. Three stories above the bustle of Folsom Street, a taxi cab honk echoes in Gustavo Ramos Rivera’s studio. Sunlight streams through dozens of large windows bringing the character of San Francisco in with it. The views are as diverse as the city’s people. The panorama stretches from the churches of Cathedral Hill to the skyscrapers in the financial district and an old brewery in the industrial section South of Market. Off in the distance, a thick, gray fog swallows one of the Bay Bridge’s towers – a reminder that light and perspective change daily with the wind. Down below, the graffiti could have better grammar and some of the trash seems to have missed the dumpster. Next door, a fake, fat cow with a halo on its head hovers above a bar. Most people who stroll by seem to appreciate the area’s dynamic. Part of a croissant and a half-full cup of coffee are left on the circular, antique dining table. Books are stacked on shelves and spread out everywhere. Some are in English, some Spanish. From Baudelaire to Virginia Woolfe, it’s a deep, eclectic library. With no diplomas to hang in his studio, Gabriel Garcia Marquez and Octavio Paz are among those who get credit for Gustavo’s education. Thanks to their brilliant writings and ways of thinking, a worldly wisdom rolls off his tongue. No art classes either. Ramos Rivera is a painter, printmaker, book illustrator, collagist and sculptor who is entirely self-taught. Each morning, Gustavo takes a stroll from his apartment in North Beach to the pier and opens his eyes as wide as his mind. “Have you seen old men when they sit down?” Ramos Rivera asks. “They don’t have to say much, it’s just fun to watch them enjoy the sun.” Ramos Rivera does not focus on how someone looks, rather how they feel. “I wonder if everyone sees the world with the same colors I see.” Indeed, color dominates his day. A kaleidoscope of hues is constantly swirling in his head. The people and objects that share his space are important, but he’s most interested in reaction and emotion. It’s the simple enjoyments and obvious sorrows that register with him. Each observation comes with its own shape and color and is lodged somewhere in his mind. Deep down a painting is born. The transformation from Gustavo Ramos Rivera into working artist begins with a quick change into scrubby sweats and paint-splattered tennis shoes. Then, he thumbs through his extensive CD collection: Puccini, Yo Yo Ma, Jack Johnson, as well as jug bands, Tibetan flutes and Beethoven – lots to choose from. “Music is a great antidote for many things,” he says. Rivera thinks big and works big. The problem is that the space to get paintings in and out of his studio is small. That’s why Gustavo works in panels. He pushes two of them together to make a 7’x7′ canvas. As Ray Charles’ soulful sound sets the mood, Ramos Rivera’s shoulders relax and he finds his groove. The choreography is spontaneous, yet incredibly intimate. It’s a long, slow, beautiful dance with his work, and Gustavo never misses a step. He begins by drawing black lines and circles over both panels with a charcoal stick. The design has the look of doodling with the importance of an engineer’s blueprint. Next, he whips out a three-inch brush with a long handle. He begins by staining the canvas with water-based pigments and then changes to oils. The paint glides on: red, then yellow, followed by electric blue. Rhythm and focus can be seen on his face. His wrists are loose and fluid. Subtle variations of color and intricate patterns are beginning to come to life. Then, suddenly, Ramos Rivera stops. He takes a deep breath and something obviously clicks. He flips both paintings 180 degrees and switches the left with the right. 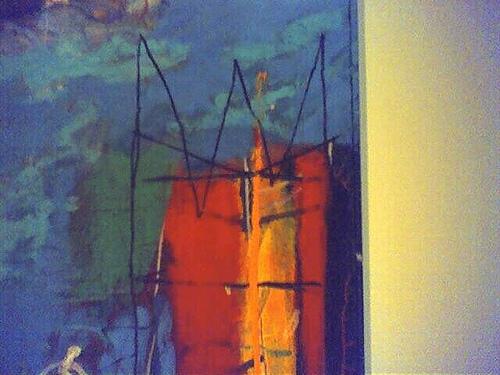 His mind knows now what his soul knew from the start; he’d been painting this piece upside down and in the opposite order. As he pushes the panels back together, incredibly the piece becomes more congruent and in flow. Magic is the only explanation for what just happened. Gustavo starts up again. The pace is moving lightning fast now; it’s as if he’s attacking the canvas. He wields the brush like a weapon, dipping it right into the jar adding big globs of paint to the piece. Then, he switches to a putty knife to push and pull the paint. He even grabs the tube itself and scrapes it along the canvas to help emphasize lines. After twenty minutes of non-stop action, Gustavo lays down his brush. “That’s the start,” he says. Ramos Rivera takes a step back to soak it all in and assess his work. His eyes dart from side to side, up and down. They pause occasionally as he takes in the activity on the canvas. He nods. This visual world clearly belongs to him. Ramos Rivera is immersed in culture; several of them tug at his sensibilities. “I feel like a citizen of the world in a way,” he says. Ramos Rivera spends several months in San Francisco as well as time in Guadalajara, northern Mexico and Colombia. With a population of more than three million, Guadalajara is Mexico’s second largest city. Monuments, parks, flowers, and trees line the avenues adding a serene charm to a city with a fast beating pulse. Gustavo’s hangout there is in an enclosed studio/house in the Santa Teresa neighborhood, where he is a guest of Ana De la Cueva, a cutting edge digital painter. The home has a patio inside it with old, welcoming tile. Ramos Rivera goes there to relax in the warm weather and draw inspiration. He goes for the same spiritual walks each morning in Mexico as he does in the states. On several occasions, he saw a scissor sharpener ride through town on a bike blowing his whistle looking for business. He watched as people ran out of their homes with dull knives that needed attention. There’s an amazing energy throughout this interaction, and an interesting metaphor about life and fresh perspective to be learned here. 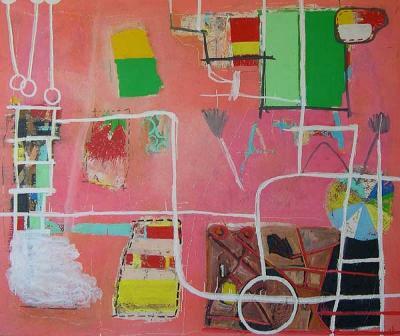 Ramos Rivera channeled it into a recent painting that still sits in his studio. One of his favorite things to do throughout the country is to watch all the colorful ceremonies. It’s a tradition that brings back fond memories. Gustavo got the lesson of a lifetime when some painters came to town to do a mural at the church. “I went to watch them everyday. They saw that I was there, and they invited me up on the scaffolding. Well, soon I was cleaning brushes and painting a couple spaces. The maestro in charge of painting the murals took it upon himself to teach me how to mix paint and how to do this and how to do that.” Ramos Rivera took what he learned and headed straight for the countryside where he learned how to paint plein air. Gustavo knew art was his calling. “For a little while, I worked in a food store. I was lucky, though, because I got to do the signs outside the store. I was the food store artist.” At age 17, he bought and stretched his first canvas. Gustavo began painting during a unique era in Mexican art. Rufino Tamayo combined indigenous art with contemporary European styles and painted what he knew – the colors of his land and his aunt’s fruit stand. It was the beginning of a new period in Mexican art. Ramos Rivera was exposed to Tamayo’s inventiveness and coloration. He also loved the work of Catalan artists Joan Miró and Antoni Tàpies. The way Miró played with brilliant colors and simplified forms resonated with how Gustavo saw the world. Ramos Rivera also turned his attention north of the border. Artists like Richard Diebenkorn were doing amazing things with sequencing and space. Robert Rauschenberg’s pop collages said so much about texture and depth. Ramos Rivera soaked it all in. He began mixing all these modern styles with his own cultural traditions. Soon, his own symbolism began to emerge. It was 1969, just after the Summer of Love in San Francisco, when Ramos Rivera got his first glimpse of the City by the Bay. The hippies were still there and the war protests were still going. Gustavo even held a sign or two at those massive demonstrations in Golden Gate Park. The Grateful Dead, Janis Joplin, Jimi Hendrix – Ramos Rivera saw them all live in concert. The influence of the Bay Area Figurative painters and the culture, the attitude and the literature from the Beat Generation continued to hang on. The community of artists, poets and musicians worked and played together. “The city had this great character,” he says. San Francisco gave him something else he craved – isolation. As the 1970’s passed by, Ramos Rivera’s work continued to evolve. The left coast was completely ignored in the world art community. New York and the so-called Neo-Expressionists had the hot new ticket, and Gustavo wasn’t part of that. He enjoyed being alone with his thoughts and his canvas. He worked on trusting his technique and honing his style. His art was getting into galleries, but unlike those that came before him – Manuel Neri, Elmer Bischoff, Nathan Oliveira, etc., Ramos Rivera wasn’t applying for grants, had no G.I. Bill money and wasn’t able to fund his career through teaching – but he had no complaints. He survived by doing gardening, house paintings, architectural renderings and other odd jobs. By 1980, he’d scraped enough money together to rent the studio on Folsom Street. The space gave him the ability to focus his ideas and expand his work. The first breakthrough was a complete twist of fate. He’d bought tar to patch some potholes in the road. It was a simple enough solution that led to an interesting idea. “I liked the thickness of the tar, the texture; it’s a petroleum-based material. I thought maybe it would go well with oil paint, so I mixed it all together with a big wooden spatula. It was great for experimenting.” Over the next few years, he completed a number of large canvases combining paint, tar, wood and other materials. Each piece in the series looks like Ramos Rivera’s earlier abstract work, but buried under a sea of black. The glimpses of color were scratched from the tar surface or directly applied to the canvas. Material mattered to Gustavo, and his studio became a stage for artistic improv. Ramos Rivera began attaching scraps he found on the streets to his work. “Collage is a very informative medium,” he explains. “I’ve always collected things that take my attention, old cardboard from the street, pieces of wood, labels, some cloth, newspaper, or sticks. Sticks have a very craft-like feeling that you can do anything with them. You can build them up. You can mark something. Nature has a very great shape.” The materials added line, texture and nuance to his art. Placement was never really permanent. Like a boxer, Ramos Rivera was able to stick and move until he knocked his genuine vision out of the ring. Collage allowed Ramos Rivera to bring pieces of his life directly into his art. “To me, it was like bringing folk art into a modern context,” he says. Some of the most interesting examples are from a series of free-standing sculptures that look like make-shift, abstract totem poles. He calls them “skeletons.” They’re made out of broom handles, wood scraps and tree limbs. They’re painted with brightly-colored enamel and fastened together with wire. The “skeletons” become symbols, or better yet, the framework for dancing, fishing or acrobatics. They have titles like Esqueleto de un bajista/Skeleton of a Bass Player, Esqueleto de un coyote/Skeleton of a Coyote and Esqueleto de una cazadora/Skeleton of a Huntress. They act as visual vehicles to help him better understand how line, color and shape fit together. Ramos Rivera has always done the same thing with drawing. At first glance, his works on paper look like doodles. But somehow those random, chaotic scratches and bursts of color become curiously interconnected. Whether it’s charcoal, graphite, oil or acrylic drawings, they are experiments aimed at triggering the part of his subconscious that controls his art. Most often, he pulls out the paper to warm up or get in the mood to paint. The drawings that he often just sets aside are an important part of his legacy in understanding his artistic vision. As is his work as a printmaker. Working with ink is a source of spontaneous satisfaction for him. Gustavo is a fan of monotype because it allows him to draw out the same emotions that are present in his paintings. He paints on Plexiglas and occasionally adds elements of collage. The imagery for Ramos Rivera’s monoprints often stems from his love of poetry. “Haiku is like a painting to me,” he explains. “Four lines affect my imagination. Even though they’re black and white words, whoever is reading it gets their own interpretation and puts color, images, and situations in there.” Gustavo has collaborated with Juvenal Acosta and other poets to produce beautiful art books. In 2003, Ramos Rivera began a series of accordion-fold books featuring his drawings and collage. The art was done on colored construction paper, bound with a cover and tied in a bow. Gustavo’s idea of the perfect afternoon would include drinking a little wine, enjoying the weather and painting plein air. The traditional landscapes are for peace of mind only. They remind him of his younger days. “Why should we stop doing the things we like to do?” Gustavo asks. Ramos Rivera’s visual language mixes the spiritual depth of poetry with the beautiful score of a string orchestra. His unique use of color, line and shape showcases the essence of living. Through artistic action and a complete appreciation of nature, Gustavo’s work has both matured and remained fresh. He was born with an incredible gift and has been blessed by experience. It’s with grace that he signs Gustavo Ramos Rivera on each canvas. He lays down his brush with the setting sun. The magic will return with tomorrow’s morning light.